Description: Quake is the perfect carpet prespray and traffic lane cleaner for filthy apartments, rental units, and commercial carpets. It is packed with uncompromising, hard-core cleaning chemistry. It will cut through grimy grease, oil, food and beverage spills like they were not even there. Usage: For pump sprayers, mix 8 oz. of Quake into 1 gallon of hot water. 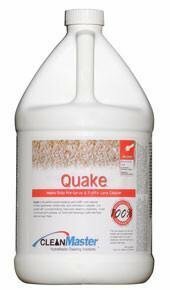 For injection sprayers, mix undiluted gallon of Quake with 1 qt. of water into 5 qt. container.